1. Mild discomfort following surgery is normal. 600 mg of Ibuprofen or 500 mg of Tylenol should be sufficient. You have been given a prescription for pain or an antibiotic regimen, take as directed. 2. If gauze dressing has been applied, gently discard 30 minutes after leaving office. 3. Do not lift or pull lip to examine surgical area because repeated irritations may delay healing. 4. Slight swelling and skin discoloration is normal. In order to minimize swelling, apply an ice pack over the surgical area with gentle pressure, 20 minutes on and 10 minutes off, for a period of 3-4 hours and not to exceed 6 Std..
5. Adequate food and fluid intake following surgery is most important. Soft cold foods are best, such as ice cream, Jello, pudding, yogurt. Crusty, hard, very warm foods and carbonated beverages should be avoided. If eating is difficult, a diet supplement (eg. Sego, Nutrament, Slender) is recommended. 6. Avoid strenuous activity for the next few days and rest as much as possible. 7. For 24 hours following surgery, a soft toothbrush may be carefully used in the areas of the mouth involved in the surgical procedure. DO NOT floss. 8. Avoid rinsing until evening. Thereafter, gently rinse with warm salt water or Listerine after each meal and at bedtime continue this procedure for 3-5 days. 9. Sleep with the head slightly elevated the first night following surgery. 10. Do not smoke for the first 24 hours following surgery. 11. Slight oozing or bleeding is normal for the first 24 hours. If bleeding persists apply firm and steady pressure with a cold moistened tea bag for 20 minutes. If bleeding continues, please call. 12. Any unusual symptoms such as excessive bleeding, swelling, or elevated temperature should be reported immediately. 14. Do not be alarmed if during the healing progress some of the sutures become dislodged. They are often designed to dissolve over a period of time. It is important that you return for a post-operative visit in 5-7 days. Feel free to call on us at any time for advice or help. It is our desire to have you as comfortable as possible during the healing period. Are There Any Potential Problems After Surgery? 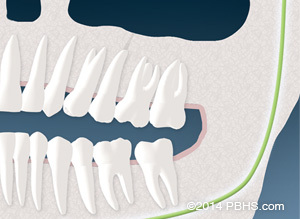 Upper teeth and sinus communication. 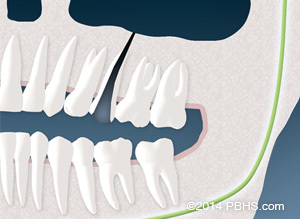 The upper teeth are situated near your sinuses, and root canal surgery can result i�n a communication between your mouth and the adjacent sinus. Should this complication occur, it will usually heal spontaneously. We will give you special instructions if this is apparent at the time of surgery. We prefer that you don’t blow your nose for two to three days after surgery. If you have to sneeze, you should sneeze with an open mouth into a tissue. You should not create any pressure in the sinus area. If you sense a complication after surgery, please contact us.